Granulomatous meningoencephalomyelitis (GME) is an inflammatory disease of the central nervous system in dogs that is characterised by focal or disseminated granulomatous lesions within the brain and/or spinal cord, non-suppurative meningitis and perivascular mononuclear cuffing. The aetiology of the disease remains unknown, although an immune-mediated cause is suspected. This article reviewed the typical history, clinical signs and pathology of the condition along with current opinions on pathogenesis. The potential differential diagnoses for the disease were discussed along with current treatment options. Granulomatous meningoencephalomyelitis (GME) is an idiopathic inflammatory condition of the central nervous system (CNS) in dogs that was first reported by Braund and colleagues in 1978. Since that report it has been observed worldwide [10, 19, 2, 25, 26, 14]. Early reports quoted a variable incidence of between 5% and 25% of all CNS disorders in dogs ; more recent prevalence information is unavailable. Histologically, GME lesions occur predominantly within the white matter of the CNS, characterised by dense aggregates of inflammatory cells arranged in whorling patterns around blood vessels. These perivascular cuffs (Figure 1) comprise principally macrophages along with varying numbers of lymphocytes, monocytes, plasma cells, and lesser numbers of neutrophils and multinucleate giant cells [4, 10, 6, 23]. L ymphocytes and macrophages represent the dominant cell types in the lesions; however, marked variation is described: some granulomas being principally lymphoid, some not perivascular, and some with eccentric development of a granuloma from an existing perivascular cuff [2, 6, 23]. Typically, lesions are widely distributed within the CNS but they occur most commonly within the white matter of the cerebrum, cerebellum, caudal brainstem or cervical spinal cord. Comparable lesions may also be observed in grey matter and there may be lesions involving the vasculature of leptomeninges or choroid plexus [6, 31]. 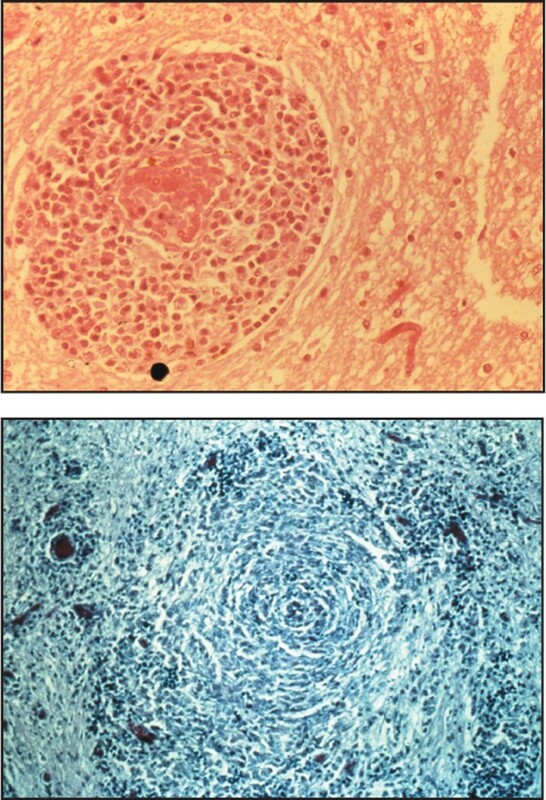 Sections from brains of GME cases: A) Section showing a characteristic perivascular cuff lesion around a blood vessel comprising a predominantly mononuclear inflammatory cell infiltrate. Haemotoxylin and Eosin. Original magnification ×40 (top left). B) Section demonstrating characteristic 'whorling' pattern of inflammatory cells within the CNS white matter. Reticulin-staining. Original magnification ×20 (bottom left). Three forms of GME have been described, based primarily on the presenting clinical signs, namely: focal, disseminated (multifocal) and ocular [6, 31]. However, in both focal and disseminated forms, the lesions are usually widely scattered throughout the CNS; in the focal form there is a coalescence of neighbouring granulomas to give rise to a space-occupying lesion that is responsible for the clinical signs of a focal lesion [6, 16, 32, 39]. Focal lesions are reported to be more common in the cerebrum and brainstem [6, 27]. There has been some confusion in the terminology used to describe GME, particularly in earlier reports where the term 'reticulosis' was used to describe the disease (Reviewed: ). Reticulosis refers to "an abnormal increase in cells derived from, or related to, the monocyte macrophage" . Since the lesions of GME represent an accumulation of macrophages, by definition GME would represent a subset within the broader category of reticulosis. The historical description of reticulosis involved further classification of cases as either inflammatory or neoplastic reticulosis based on histopathological features such as mitotic index and cellular pleomorphism . The use of this terminology has been largely superseded; it is generally accepted that GME and inflammatory reticulosis are terms that have been used to describe the same condition [10, 16, 39]. In addition, as immunohistochemical staining methods have been applied to some of the archived tissue sections, it has been shown that some cases previously classified as neoplastic reticulosis may be more correctly referred to as CNS lymphosarcoma . An infectious aetiology has been suggested by some authors . However, compelling evidence for any one infectious agent has not been presented. Several authors have suggested that, in view of the increased recognition of GME as the cases of distemper decline with routine vaccination , GME may reflect an aberrant response to canine distemper virus (CDV), or even a modified immune response after vaccination. However, there have only been sporadic reports in the literature identifying CDV in GME cases, employing either immunohistochemistry  or serology . In addition to their sporadic nature, these results have not been corroborated by others [39, 23]; nor have newer techniques, such as PCR, provided supportive evidence . Negri body-like inclusion bodies and Toxoplasma-like organisms have been reported within lesions; however, the occurrence of GME within countries known to be rabies-free [19, 2] and negative serology results for protozoal organisms in large studies  would tend to argue against these aetiologies. Sutton and Atwell  reported GME in two dogs after treatment with levamisole (a known immunostimulant); along with the reported occurrence of inflammatory CNS lesions following levamisole administration , this may suggest a reaction to a previously latent antigen, possibly of infectious origin. A possible aetiological relationship with LaCrosse virus has been proposed based on similar histopathological findings . Some authors have speculated on the possibility of a retroviral infection, possibly a vaccine contaminant . A report of GME in two related, co-housed Afghans  could suggest an environmental, genetic or infectious cause. An immune-mediated aetiology has been suggested by Kipar et al. and by Wong and Sutton . Immunohistochemistry demonstrated that inflammatory cells within GME lesions consisted predominantly of MHC Class II antigen-positive macrophages and CD3 antigen-positive T lymphocytes . These findings are suggestive of a T cell-mediated delayed-type hypersensitivity (DTH) reaction. Finally, and particularly with large focal GME lesions, a neoplastic cause has been postulated since such lesions may have a variable mitotic index and varying degrees of cellular pleomorphism . It has certainly been demonstrated that, on occasion, focal GME may represent the misdiagnosis of a lesion that is actually CNS lymphoma or neoplastic histiocytic disease . GME occurs most commonly in young adult small-breed dogs [12, 27, 14]. However, there is a wide variation in reported patient data. Table 1 is included to highlight both the 'classical' data reported along with variations that have become apparent as more reports of the condition have been published. GME occurs in both sexes; however, there appears to be a higher prevalence in females [31, 3, 27, 14]. As is the case with the majority of CNS diseases, the clinical signs observed in an animal with GME primarily reflect the location of the inflammatory lesions within the CNS rather than being specific for the disease itself. Table 2 summarises the typical clinical signs that are observed with lesions in each of the main regions of the brain. Table 3 provides a summary of the clinical signs that have been observed in the GME cases reported in the literature. It should be noted that these numbers represent an approximation only. The major limitation is that papers vary in the details given and in their classification of the clinical signs. Some listed the specific clinical signs, others listed the affected regions of the brain. Here the signs are listed as they were given in the papers (from [8, 19, 2, 16, 3, 32, 39, 27, 21, 33, 40, 24, 15]). Animals with the disseminated form of the disease have signs reflecting dysfunction of two or more of the following: cerebrum, brainstem, cerebellum, spinal cord, meninges, and optic nerves. This disseminated form accounts for approximately 50% of the GME cases and has generally been accepted to occur with acute onset [30, 6, 27]. The focal form of GME is characterised by signs attributable to a single space-occupying lesion. The more commonly reported signs reflect lesions within the cerebrum and brainstem. However, clinical signs can reflect a lesion at any location within the CNS. Focal GME also accounts for approximately 50% of the presentations and, typically, it has been associated with a slower onset, e.g., three to six months [6, 27]. Despite this historical perception that the disseminated form has an acute onset and the focal form has a more chronic presentation, there is considerable variability (Jones, Merrett and O'Neill, unpublished data). In addition, this viewpoint that the disease time course correlates with the focal and disseminated forms has more recently been challenged by Demierre et al. who found that the disease course was not correlated with the size of lesions but rather with the extent of mast cell infiltration. The ocular form of GME is uncommon and is usually characterised by sudden onset of blindness due to optic neuritis, occasionally with uveitis and more rarely with retinal haemorrhage or detachment . Typically, the disease is bilateral but it can be unilateral. Some dogs that initially present with the ocular form may later progress to develop other neurological signs . Routine screening blood tests are often unrewarding for making a diagnosis of GME . 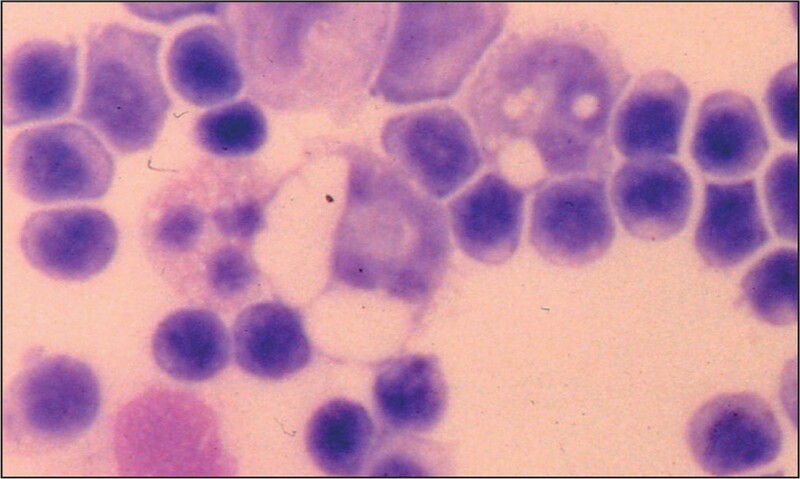 In some cases mild to moderate leukocytosis is observed [31, 40], although frequently the rise is within the range encountered with 'stress' responses  and elevations are not seen in the majority of cases . Whilst CSF analysis is the mainstay of diagnosis , considerable variation in the findings may be encountered. Table 4 shows the classical features of GME and variations that may be expected. Figure 2 shows CSF cytology from a GME case. Occasional cases (~10%) may have normal leucocyte counts . Occasional cases (~10%) may have up to 50-60% neutrophils [3, 27]. Some cases with relatively fewer lymphocytes than monocytes . Occasional cases (~5 to 10%) may have normal protein concentrations . previously treated with corticosteroids . Cerebrospinal fluid cytology demonstrating mononuclear cell pleocytosis in a case of GME. Original magnification ×40. Of the few reports of magnetic resonance imaging (MRI) and computed tomography (CT) scanning of GME lesions, most have yielded evidence of space-occupying lesions that cannot be definitively differentiated from neoplastic lesions [15, 33]. In one report of 12 histopathologically confirmed GME cases that underwent CT scanning, the only statistically significant differentiating feature of GME cases was the hyperdense appearance of the lesion prior to contrast enhancement . Variable MRI findings have been reported . Unsurprisingly, there are no reports of detection of the (microscopic) disseminated lesions. Brain biopsy is required to make a definitive antemortem diagnosis of GME and, in particular, to differentiate focal GME lesions from neoplastic disease . As discussed above, the observed clinical signs most typically relate to the location of the lesion rather than to its nature . Hence, the list of differential diagnoses to be considered is often large. The clinical detection of a diffuse CNS disease is most suggestive of infectious, inflammatory or neoplastic disease. Signs of a focal CNS lesion can occur with any space-occupying lesion (e.g., neoplasm, inflammatory granuloma, cyst, or infarct). Furthermore, there are numerous potential causes of optic neuritis. Hence, the clinical findings are far from specific. In order to rule out canine distemper, one must perform canine distemper virus antibody titres or canine distemper virus PCR on CSF samples. These diseases represent major differential diagnoses  and in order to differentiate them from GME one should carefully assess the patient for extra-CNS disease. In addition, serum titres for antibodies or CSF/serum PCR for organism can be evaluated. Fungal CNS infection typically gives rise to a greater eosinophilic component in the CSF and fungal elements may be identified in the CSF . There are several sporadic reports of clinically acute and severe, multifocal, diffuse CNS diseases; typically characterised by non-suppurative necrotising meningoencephalitis. Such 'syndromes' are recognised as clinical entities affecting particular breeds: for example, pyogranulomatous meningoencephalitis of Pointers  and Pug dog encephalitis , which is recognised also in Maltese terriers , Pekingese  and Yorkshire terriers . These separate disease entities are typically associated with a particular constellation of clinical signs and would be suspected in dogs of the relevant breed demonstrating compatible clinical signs and changes in the CSF. Some cases of CNS lymphoid or histiocytic neoplasia are misdiagnosed as "GME" [41, 12, 36]. This is not surprising since the CT/MRI appearance can be identical and, on occasion, particularly with meningiomas , there can be significant overlap between findings on CSF analysis . The traditional mainstay of therapy has been corticosteroids, in particular prednisolone used at immunosuppressive doses (2 mg/kg/day) tapered with response over the following months to achieve the lowest dose possible that controls signs . It is uncommon for corticosteroid therapy to be terminated. Patients often have a good initial response, but as the dose is tapered, or with time, signs often recur and subsequently prove difficult to control with an increased dose of prednisolone. Sometimes, reducing the dose of prednisolone that had resulted in control of clinical signs can result in a severe recurrence of signs and it has not always been possible to regain control (D. Merrett, unpublished data). Azathioprine has been administered in combination with corticosteroids to allow the dose of the steroid to be reduced to avoid undesirable side effects of prolonged steroid administration (Jones, Merrett and O'Neill, unpublished data). Cytosine arabinoside - an antineoplastic agent that acts on dividing cells by blocking pyrimidine synthesis and causes premature termination of the DNA chain. This drug has been used to treat lymphoma and myeloproliferative diseases and recent reports demonstrated success in controlling GME signs [13, 28]. Procarbazine - an antineoplastic agent that damages DNA and affects protein and RNA synthesis. This agent has also been recently reported to have a positive effect on control of GME lesions . Cyclosporine, a potent suppressor of T cell function, has also been used with some benefit in a small number of cases . Radiation therapy, either focally directed or whole brain, has been described in a few papers. In one study, seven of 42 dogs received radiation therapy, of which six had focal forebrain signs and one dog had multifocal signs . The dog with multifocal signs did not respond and was euthanased shortly after completion of the course of radiation therapy. The six irradiated dogs had significantly longer survival times than the other dogs with focal forebrain signs that did not receive radiation therapy (treated with corticosteroids): the median survival time of irradiated dogs was more than 404 days (longest surviving patient more than 1,215 days), whereas the median survival time of dogs not irradiated was 41 days (longest surviving patient approximately 800 days). GME has a poor prognosis. Most studies offer the generalisations that dogs with multifocal disease typically have a short survival (e.g., up to six weeks after diagnosis) and dogs with focal disease usually have a longer survival (e.g., three to six months). There are single case reports of dogs responding for longer periods. However, large prospective studies monitoring clinical responses to the newer treatment modalities are lacking and are greatly needed to allow an accurate prognosis to be given. It is the authors' perception that the current literature provides a more negatively biased impression of the disease. Whilst the disease does carry a guarded prognosis, some individuals will respond to treatment for a considerable period of time. The presentation of GME can be extremely variable. Patients can present with acute or chronic, focal or multifocal CNS signs, suggesting pathology at many levels of the CNS. GME is a difficult disease to definitively diagnose since there are many differentials for the presenting signs and the finding of a mononuclear pleocytosis in CSF. Corticosteroids currently remain the mainstay of therapy but, because of the less-than-ideal survival time, there is active interest in a number of other agents.